"This backup solution is ideal for small and medium-sized business. When disaster happens, you can restore all the critical data to avoid expensive downtime, and get back to work soon," says Wan Jianhua, General Manager of EaseUS Software. NEW YORK CITY, N.Y., Aug. 18, 2014 (SEND2PRESS NEWSWIRE) — EaseUS Software (http://www.easeus.com/), the professional backup and recovery software provider with 10 years experiences, has announced the release of EaseUS Todo Backup 7.0. The new version has a big improvement in UI design, making it be more friendly and intuitive. The latest Todo Backup comes out with new functions like “Smart Backup,” automatic update, multi-language support, and more. EaseUS Todo Backup 7.0 becomes smarter, easier and more reliable for all home and business users. EaseUS Todo Backup is a top rated and winning-reward image backup and recovery software. Since its version 1.0 released, EaseUS Todo Backup has offered the data security protection for 6 million users. And now the version 7.0 brings more useful features to ensure the data security of PCs and Servers. “Smart Backup” is the automatic backup function which would automatically backup files once it detects the selected files is edited or updated. The feature should be able to protect your crucial data at any time. EaseUS’s interaction designers took the largest amount of the time to re-design the UI. With the newly designed and wizard-style interface, EaseUS Todo Backup becomes simpler to operate. * Automatically update, it is available to automatically update to the latest version without downloading and installing again. * Fix some bugs to improve product compatibility and quality. * Trial version period extends from 15 days to 30 days. “This backup solution is ideal for small and medium-sized business. When disaster happens, you can restore all the critical data to avoid expensive downtime, and get back to work soon,” says Wan Jianhua, General Manager of EaseUS Software. As he described, EaseUS aims at offering the complete data security protection solution for your data and business. EaseUS, Founded in 2004, is the professional IT solutions provider. It mainly offers data recovery, backup, system optimization and partition manager for home, education and SMB users. During the 10 years, EaseUS has established itself as a fast-growing international company with over 100 million wonderful users around the world. Here is the homepage: http://www.easeus.com/. 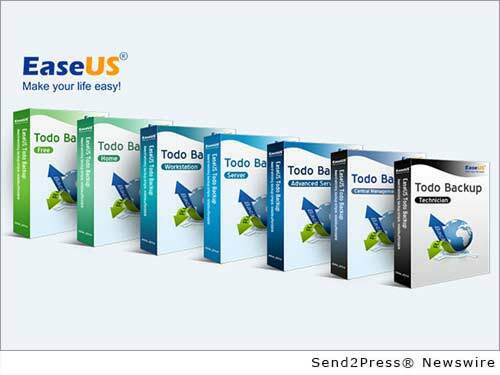 Original Keywords: backup and recovery software, Todo Backup 7, data security of PCs and Servers EaseUS Software New York City New York NEW YORK CITY, N.Y.
REFERENCES: New York Business News, backup and recovery software, Todo Backup 7, data security of PCs and Servers EaseUS Software New York City New York NEW YORK CITY, N.Y.